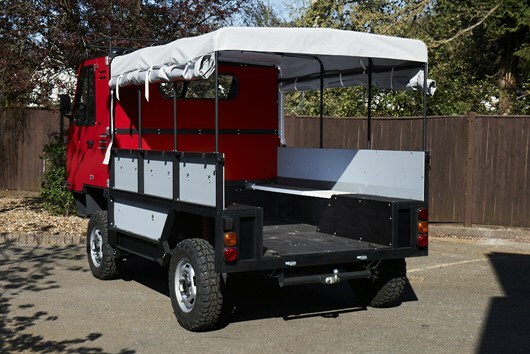 A British company has come up with a novel solution to transport problems faced in the developing world – by designing a flat-pack truck. Called the ‘OX,’ it can be shipped to Africa in cargo containers for assembly without specialised tools or skills. Construction from start to finish takes three workers approximately 11.5 hours. Despite the vehicles simplicity it is robust enough to wade through 75cm of water and to cope with the rutted, rough, potholed roads of deepest Africa. It has a maximum payload of two tonnes, which is twice that of the average pickup truck. It can carry 13 people, 44 gallon-capacity drums or three Euro pallets. 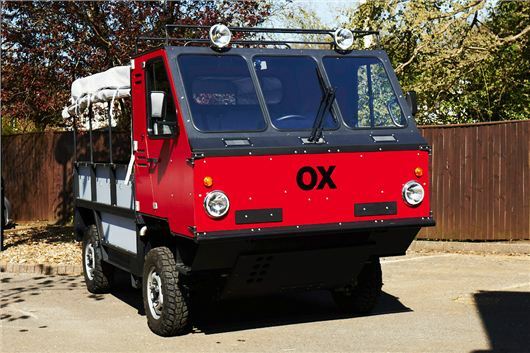 Additionally it features a power take-off, meaning it can pump water, power a saw or run a generator – useful in rural terrain, which the OX is designed to cope with. Ground clearance is high and there are short front and rear overhangs to help with climbing and descending steep hills. Power comes from a 2.2-litre diesel engine linked to a manual transmission. The driving force behind GVT, the company behind the vehicle and the OX itself is Sir Torquil Norman, founder of the Norman Trust. “…OX became a dream three years ago and is now a realistic ambition with a working prototype that has already completed its initial testing programme,” he said. So far £1m has been raised but in order to take the project to production stage a further £3m is needed. “Our priority now is to raise the funding to complete the testing and take the project to fruition. Our aim is that the OX will be purchased by charities, aid organisations and development programmes, rather than private individuals. My dream is to one day see an OX in every village in Africa,” concludes Sir Torquil. Looks like a damn good idea- as long as it really is that easy to build. The electrics need to be as simple and as robust as possible, and ‘foolproof’- the best vehicle in the world is useless if built haphazardly. Front wheel drive may prove adequate most of the time, but ideally it should have built in winching points to allow self-recovery. What engine is it? 2.2 suggests a standard Transit/Defender engine. Will the emissions equipment be taken off- as could prove problematic in developing world conditions. Even rich Germans who buy very expensive off-road vehicles (Unicats, etc) to go driving in the deserts usually avoid anything above Euro3. If flat pack furniture is anything to go by, that thing will be a right bugger to put together. No doubt a screw will be missing and all the instructions will be printed in font size -12, with diagrams as clear as the River Humber. And then someone will drop a screw, tread on it, swear and then loose the instructions and have an argument over who’s fault it was. All this would take place in the African Bush. I like it. Want one. In kit form, of course. Any chance of this company shipping a few kits to Longbridge? 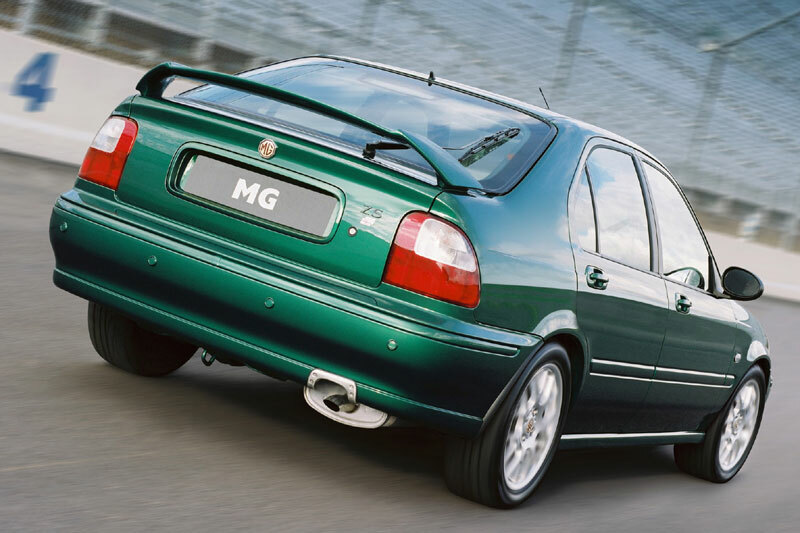 A commercial vehicle range could provide a much needed sales spike for MG Motor (UK) and after all, they have experience of producing cars from kits as well. @3,A well informed piece,but lets not forget that most of the world plunders its riches day in day out. China has been there for more decades than anyone can care to remember paying despotic regimes with arms for all the resources it harvests from these countries. Are you trying to say the folk here are less than civilised? maybe sub human? Dangerous ground. Perhaps our greedy civilised world bears some responsibility eh? Very good point well made, francis brett. @ Chris Baglin. Good thinking, but I take the “If it looks like it fits it does-if it won’t fit, make it fit” line of thought. At last – an upgraded Africar! Such a pity the original floundered and folks landed up in jail – for the those not versed – google it or better still buy the book! @3. Have you ever been to Africa? You do realise this is a nation of people – just like you. They have parents, grand parents and there a children – families – just like you and I. Just because they happen to live in a different country with different cultures and a greater degree (by what margin I’m not quite sure) of corruption than the UK, you want us to turn our backs and not help them? Following a recent well – publicised world rally, a speaker at Boooklands made it clear that the Etheopians were the most generous and kind people the drivers met on their trip from London to Cape Town. These people had ‘nothing’ yet they gave their time, beds and food expecting nothing in return – except to know they helped. Africa is a beautiful country full of (mostly – just like ours) beautiful people. They are larger than life, want to work and have nice things. One guy I met worked hard as a Taxi driver and ran a small farm – he earns less in a year than my neighbour spends on Gym fees in a month. Surely it doesn’t matter if Live Aid and Save the Children and even ideas for better transport are still happening in 50 years time. Hopefully they will have sorted it but if not we in Britain will still be able to afford to help – and these people are human beings. I will help and thank goodness there are millions like me. I am known as a moderator – always looking at both sides. But on respect for human life I lose my moderate voice. Top words Wolseley Man, 100% spot on. The flat pack truck is an interesting idea. Regarding Africa’s problems – sure, charity begins at home and yes the on-going economic crisis means that Western countries are unable to give as much money as before if any (certainly not to emerging superpowers like India and China or to a bankrupt country like Egypt), but it is unfair to blame the people for Africa’s problems. Problems, which I might add are mostly caused by corrupt governments / despotic regimes in Africa taking all of wealth (along with the Western aid) to enrich themselves at their own peoples expense, just like other corrupt governments / despotic regimes outside of Africa. A great idea and I hope it finds success. @13 may I add my praise to your word. ‘It can carry 13 people’… in other words when you see one in West Africa it will be carrying 27 people 4 chickens and a goat. Hope it’s a success. Innovative, basic transport with no bells or whistles. I hope it is a success, but I also hope that it does not fall into the same criticisms of the OLTP project, being seen as imperialistic by those supplying the item, or some had the opinion that money is spent on buying a batch that could be spent buying medicine, water pumps or livestock. Sounds like a good idea, hope it hold up to the standard of roads it’s expected to deal with. My Girlfriend is from Cameroon & has done a lot for herself. He’s from a well off background but, she & as have most of the rest of her family have put in that extra effort to improve themselves. Sounds fantastic, too often designers concentrate on wants and not needs. #3 – None too casual racism aside, have you ever considered that finding a gaping hole in an international market and then working to design and manufacture a solution could actually be a damn good business model. How does it compare cost wise to a used truck I wonder? I’m assuming this will still be an expensive item. All very nice with one glaring error. Africa was doing very nicely thank you until the British (yes that would be us) turned up dredging in their wake fervent godbothering, slavery, disease along with overpopulation & such luminaries of racial tolerance as Sir Cecil Rhodes, Lord “oh what a big army I had” Chelmsford and Winston Spencer “Concentration Camps, how jolly ripping” Churchill. Now, perish the thought this guys suggesting giving them their own personal CKD wirbelwind (just add MG42) -what could possibly go wrong? Oh and to 3 – the reason the place is such a bloody awful mess is due in the main to the habit of the british to either start or encourage tribal conflict for their own ends -the genocide in rwanda, which just happened to take the life of someone I loved very deeply was one such conflict. If you dont have something sensible to say, shut the hell up! I enjoy your posts- you are very much your own person with strong opinions, usually well expressed. But I do not think it fair of you to abuse Wolseley Man for his post- he may not have gone into the ‘whys’ and ‘wherefores’ of the mess that many African countries are in- and how British colonial interests have contributed to that destablilisation. And whilst we did engineer tribal conflicts for our own ends in the past- and created some pretty poor models of ‘Governance’, I don’t understand how Britain directly caused the recent conflict in Rwanda- at the end of the proverbial day, those involved must take full responsibility for their own appalling genocidal behaviour. Tribal conflicts in Africa occured long before the British and other colonial powers appeared there- as did famine, disease and slavery- all of which will doubtless go on, ebbing and flowing, for as long as human beings covet those things that others have- these tendencies occur in virtually every population, and even strong international laws and democracy cannot fully rein in these tendencies- within living memory war raged within the heart of Europe. I am sorry for your loss- but Wolseley Man did have something valid and appropriate to say on the matter- I think his post was entirely sensible. @27,and 25, Britain still hasnt learned to keep its nose out of other countries affairs,most notably Libya-now one of the most dangerous countries in africa torn by tribal devides because we fell out of love with Gadaffi. Egypt is a hellhole in the making and stupid Hague wants/is arming Syrian “activists”-read islamic nutter terrorists. Both your opinions are salient. Its one of those ‘Your’e damned if you do, damned if you don’t’ situations with no clear-cut ideal intervention- except maybe sending in the UN, who very often, are purely decorative in these situations. You could bet that the US and the UK would have been in there like a flash if Syria was a major oil producer- but its only a bit-part player. If we could solve the problems of the world we would (whether home made, due to other countries or nature) – they are rarely as simple or straightforward as they may seem and time changes a lot. Just a quick word to thank so many contributors for their support. Steve and Jemma are quite right – I did not go into the history of the troubled country we call Africa. I have found over the years that if we study history within a blame culture, Great Britain is as much to blame as any other so called civilised country for everything that’s wrong in the world. The problem is always – how far do you go back? I spent my formative years not understanding why a nation would follow a man like Hitler to war – and then I learned about the treaty that followed the First World War. And so it is with everything from the Irish troubles to the Suez Canal. History is never simple – and I think we need to stand back sometimes and think about more than just blaming the last regime or the one we remember. Ultimately, for whatever reason and whoever’s fault it is – some people need help and we are able to help. Isn’t that all that matters? This car may help despite extreme cynicism – it may help and that is good. @29 Certainly true,our stupid politicians are quick to state that Libya only has two percent of world oil output which strangely enough equates to a £40 billion rake off for BP alone. @31, Hitler was charismatic,the people was in thrall of him. Tony Blair was charismatic too. All the charities,Live Aid etc have they been a success?Most of these countries have tanked due to corruption,look no further than overdue for assasination Robert Mugabe! On a lighter note, the African continent is home to many global manufacturers, who manufacture cars there….BMW, Mercedes, Volvo Trucks, Mazda, Opel to name a few. Admittedly they tend to be in South or southern Africa, but nevertheless it goes on there. Lets keep the banter to cars eh folks….Keiths creation here is a welcome escape for us all, and long may it continue. Thing is the UN is next to useless and if the many scandals involving the UN are an indication, the last thing any sane person would want is a UN with teeth. It is not the lack of oil that is preventing the West from intervening in Syria but Russia actively going out of its way to protect its interests (such as the Russian naval facility in Tartus), despite the Sunni nations constantly pushing the West to fight on their behalf / interests as they have always done (this time against the Alawites/Shia that the Sunnis view as infidels). @27 I didn’t rant at WM I ranted at post 3. As to rwanda there is a perfect historical descent from british interference with the two families & supporters of same (two dynasties fighting for control) that proceeded through to the modern massacres, Grace learned to shoot using an old lee enfield (guess who left that behind) at the age of 12 because even then it wasn’t safe – I wont go into what was done to her and her sister and mother, its not something I wish to remember or recount but it adds to my guilt that if she’d not gone home she’d be alive and my country is the one that propagated and exacerbated something they had no business in which killed her. Its a major reason why I’m so against US/UK wars at the moment. Africa is a continent, not a country, with as many diverse and unique nations and tribes as any other and more than some. Europe’s legacy lives on in that many political borders artificially divided peoples and tribal lands to the detriment of that sad continent today. And we displaced whole populations resettling them in ‘alien’ lands whether that be southern Americas, Caribbean, Rhodesia or South Africa. Africa was the cradle of humanity – we all stemmed from there. Damn them, damn yourself! Live Aid gets a mention or two – did you know that throughout the civil war and wars and famine devastating Ethiopia which led in utter desperation to Live Aid, Ethiopia was a net exporter of food? Succinctly: Multinational ownership of land allowed only the growing of fodder crops destined for western cattle to produce burgers…for us. If there truly is no such thing as a free lunch then our easy living often carries a too-high price paid by others. Africa probably could feed itself, and comfortably, if they are allowed to grow for themselves on their own land. They have no choice. We do. Assassination? Now there’s a really clever idea. Francis Brett for God? About as dumb as believing the West isn’t corrupt or that our corporate masters care any more for us than they do the peoples of Africa. I agree with you regarding the artificial borders by Europeans (Syria and Iraq in Asia for example are better off being divided along ethnic and religious lines) though to be honest the Europeans never had a complete monopoly on slavery (e.g. Arab Slave trade where about 10-18 million Africans were sent to Asia via the Red Sea or Indian ocean between 650 and 1900 – look up Afro Iraqi, Akhdam of Yemen and Makrani of Pakistan/India who together number over a million). In the case of Ethiopia, the famine there was pretty much down to the British brokered Nile water agreement of 1929 that more or less gives Egypt the lion share of the water from the Nile at the expense of other nations(e.g. Sudan, Ethiopia, Kenya, etc). My apologies, I mis-read your post. @37 I agree Europeans have had no monopoly on slaves, it seems every geographical area has been involved at some point including African on African, European on European, etc., etc. and horrifically it continues to this day. There are of course historical political reasons behind all that happens, everywhere. The point I was making is that while the immediacy of that horror was war, both civil and external, much of the famine could have been avoided had corporate control been either abandoned or made benign. Either: Ethiopian control of Ethiopian agriculture or corporate production of Ethiopian food for Ethiopian people. Instead they had, on top of everything else, the wrong food in the wrong place for the wrong reasons. While people starved to death. And who knows, maybe hunger was part of the driving force behind the wars anyway? Much that is now seen as wrong was, perhaps, just ‘of its time’. But we should and could be preventing this sort of profit-driven obscenity. If a useful definition of the third world is a country where most or all the assets are foreign owned, then we’re all third world now. The first world is exclusively populated by corporations. We should realize that truth and its implications. And it’s still a nice truck. @37 Hmm, not sure that globalpost is a useful source of info. Certainly not on its own. It is all too easy blame every problem there is now on the UK and other colonial countries as it stops countries taking responsibility for their own failings and issues. We can not keep living in the past and whereas we should acknowledge failings and move on in a positive way. The biggest problem in many African nations is that wealth is too concentrated in too few people. But then the same could be said of many western countries, especially as seen in the 2008-> global economic depression. The biggest problem in many nations is that wealth is too concentrated in too few people. Some here are more childish than foeti, trolling this CAR-site with their endless faux-intelligent bickering, sitting behind their PC/laptop/tablet/phone or whatever, in a country of filled bickerers, who bickered their own economy to smithereens. RIP industrial revolution. You had it, you bickered it away. That’s you own fault. And the fact that 3/4 of the continent of Africa is in a mess is your (and the whole western civilisation, plus China, plus Russia’s) fault. That’s a fact. What are you doing about it? Oh, I know; bickering and pointing away, as in “their fault”. And if it’s not their fault it’s certainly Churchill, or Thatcher, or the Pope, or Santa Claus, or if all else fails, maybe even E.T. And singing along with “We Are The World” from a copied tape in the 80’s was not participating in helping the continent at all, so don’t even go there. He became a Sir for a reason. Are you? Ever been there at all? Knowing what you’re talking about from hear-say does not count. Until then, put your faceless “facts” and mischief where the sun does NOT shine. ON topic: Indeed nice truck. My bad. The thing is while Ethiopia is the source of 85% of the Nile’s water, downriver countries like Egypt and Sudan, use 51 billion and 18 billion square meters a year respectively, around 90% of the Nile’s resources which would have contributed to the devastating famine. The problem is how does one make sure the aid to Africa and other 3rd nations like North Korea, goes straight to the people who need it the most rather than propping up corrupt regimes? I am disappointed with the racist and cynical comments related to Africa, it’s really not appropriate for what is being discussed here. 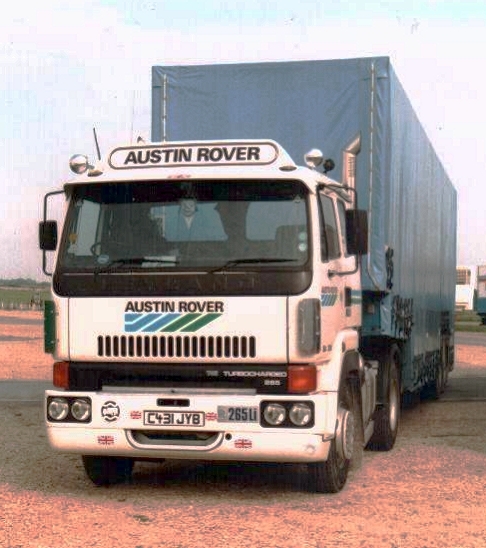 The truck looks like a miniature Forward Control Land Rover, and I am sure some enterprising people in Africa will come up with different bodies for it depending on their needs. Is the engine sourced from a European vehicle or a Japanese one? Given the popularity of Toyota Land Cruisers/Nissan Patrols in that part of the world, I figure an engine from one of those trucks would be easier to service. I like it, it reminds me of a pocket Alvis Stalwart. Has anyone found a site that gives details of the engine and drive train? @45,I agree,something like a Euro 0 engine with a Minimec diesel pump! @43 – I am slightly suspicious of people who insult others having a perfectly reasonable debate, based on the assumption that the individual is more intelligent than everyone else. If that person really does have superior knowledge why do they not contribute positively rather than attacking everyone else so aggressively? The reference to us engaging in ‘faux intelligent bickering’ is surely the most crass demonstration of rudeness. I think an apology to most of the regular bloggers on this site would not go amiss. Ok, you’re right; sorry about the tone of my rant. But anyway, I have -in general- gotten a wee tired of the endless opinionated remarks and the yes/no game-of-Ping-Pong afterward, which are completely beside the point. Not just here. Or trolling to pick a fight. But I thought, while we are at it and completely off-topic again, I could have a go too, thus I threw an opinionated remark (or two) in. But more towards people of the kind people I just quoted. But before there were people who actually gotten banned. Blaming everybody but themselves about anything. Those I meant with “some” in my opening line. It wasn’t addressed to you at all. 2. I assume nada, most of the time I have no clue what I talk about, I just had it with the negativism. That might be an answer on your question. So, an (sincere) apology to most of the regular bloggers on this site. Now, please, can we go back to cars now? I’m not a ‘car’ person (in fact, I don’t have a driver’s license), but I have travelled overland in 20 different african countries. 1. As only a couple of you have pointed out – Africa is actually a continent. It is not a country. There are over 50 countries in Africa, each of them quite different to the others. 2. Related to the above – some African countries have horrendous roads. I’m not sure that a flat pack vehicle would survive for more than five minutes on Kenyan roads, for example. Perhaps it’s suitable just for southern African countries with sealed roads.